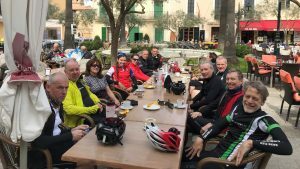 In early March, the club made its annual pilgrimage to the cycling mecca that is Mallorca. And after the winter we've had (still having at the time of writing..), it was a welcome escape to warmer climes for the week. 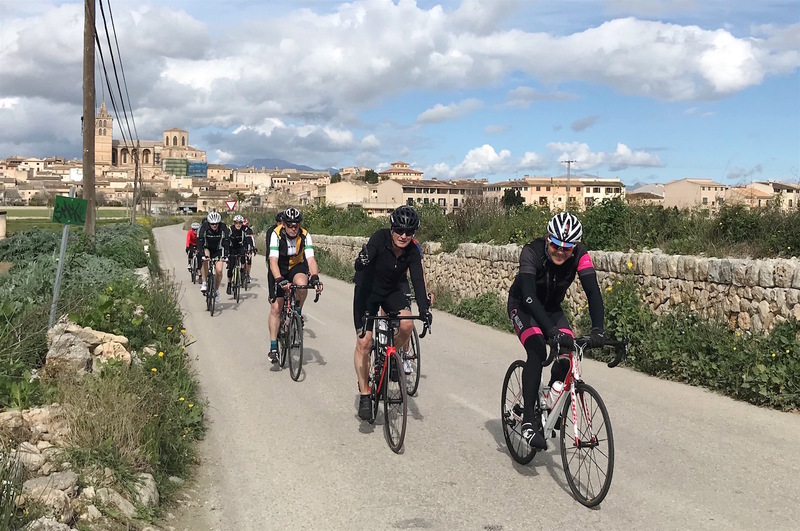 Any newcomer to the island is immediately struck by the sheer volume of cyclists on the roads - up to 150,000 cycling tourists each year, apparently. It's as if Lycra is the new national dress. 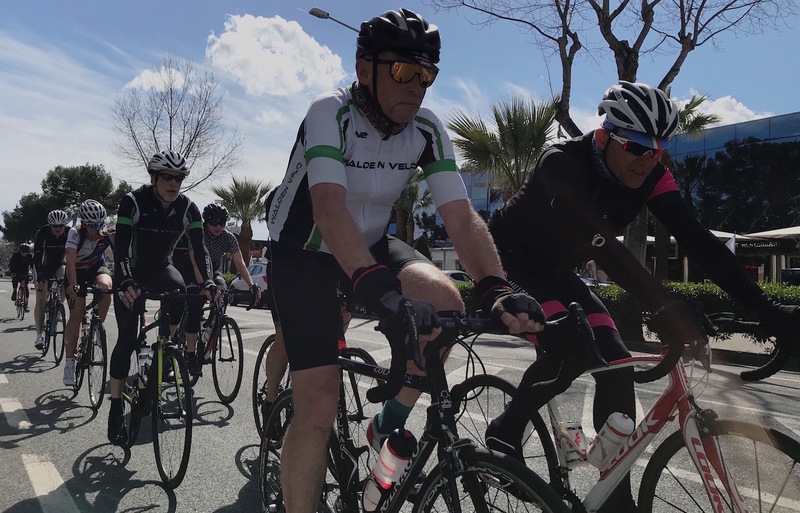 For the most part, local drivers are highly respectful to their two-wheeled guests and even required to stop in the middle of a roundabout to give way to pelotons buzzing through. On our first day, we had the privilege of being joined by professional racer and former GB team rider Dannielle Kahn. 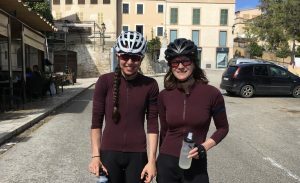 Coincidentally, I wore the same cycling top as Dannielle, but that was about the only thing I could match her on in cycling terms. 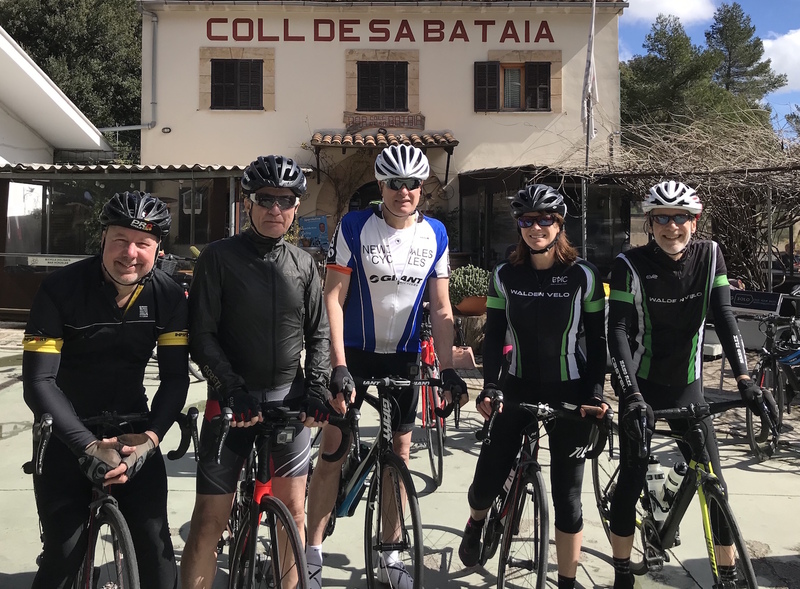 We were also delighted to be joined by Anna, who had gone to Mallorca the week before the club, but extended her trip by a couple of days to be able to ride with us. And Alan, at the start of his annual migration to Mallorca. Motivated by the presence of our impressive guest rider to bring our best game - or rather ride - we turned in a pacy 61 miles over 2200 feet, pausing midway at Sineu for the inevitable coffee and cake stop. On the way back, Gary thankfully pulled a 'mechanical' out of the bag, which gave us chance to gather our breath before pushing on to the end. No cycling trip to Mallorca would be complete without the iconic, 6-mile climb of Sa Calobra, with its snaking path up the mountain. 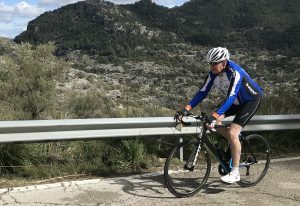 The route to get to the climb is already challenging enough, taking in a 4.7 mile, 5% climb up Coll de Femenia, followed by around 9 miles of relatively gentle undulations by comparison, and then a further half-mile or so of 9% climbing to the top. It's a whole world of hurt just to get to that point. 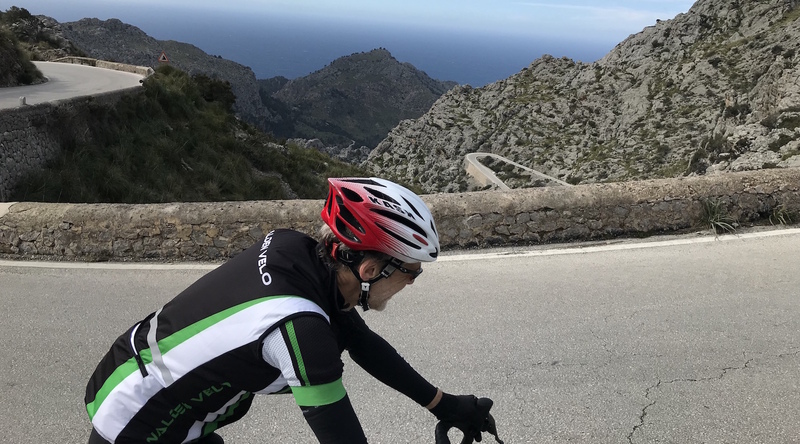 You then descend the tight, hairpin bends to reach the Port de sa Calobra, take a moment to enjoy the sea view and do the obligatory selfies to prove you got there in one piece, before returning back up the same road on a 7% climb that rises just over 2000 feet, which can take around an hour for mere mortals. It was blowing a hooley at the top of the climb, which put some of us off - including myself - from taking the descent. Geoff, Gary and David made the white-knuckle ride to the bottom on this occasion and then, according to Geoff, took the 'gentle ride in the hills' back to the top. But then Geoff is a bit of a climbing monster. 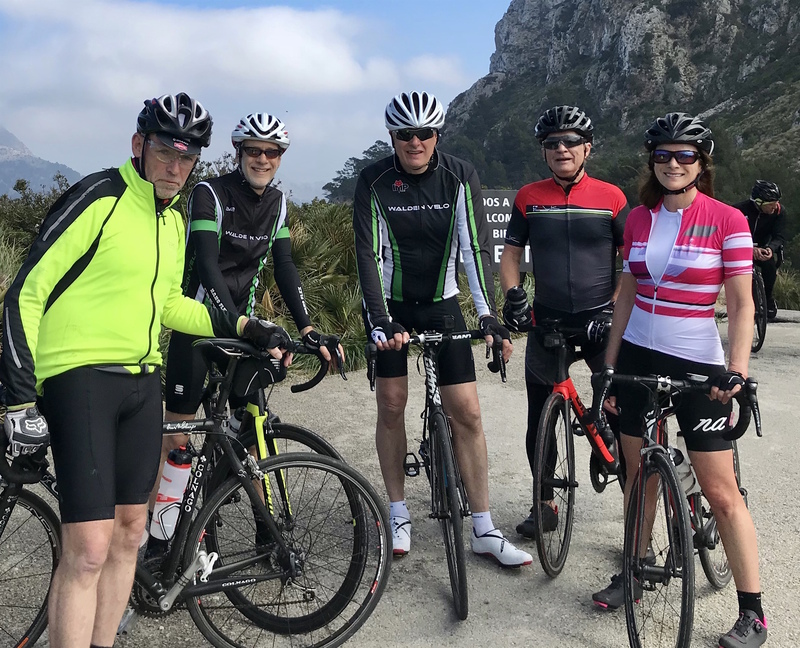 We didn't get a photo of Geoff's 'hill climb face' on Sa Calobra, but I'm sure it was equally impressive as the one on the hill near Wendons Ambo. 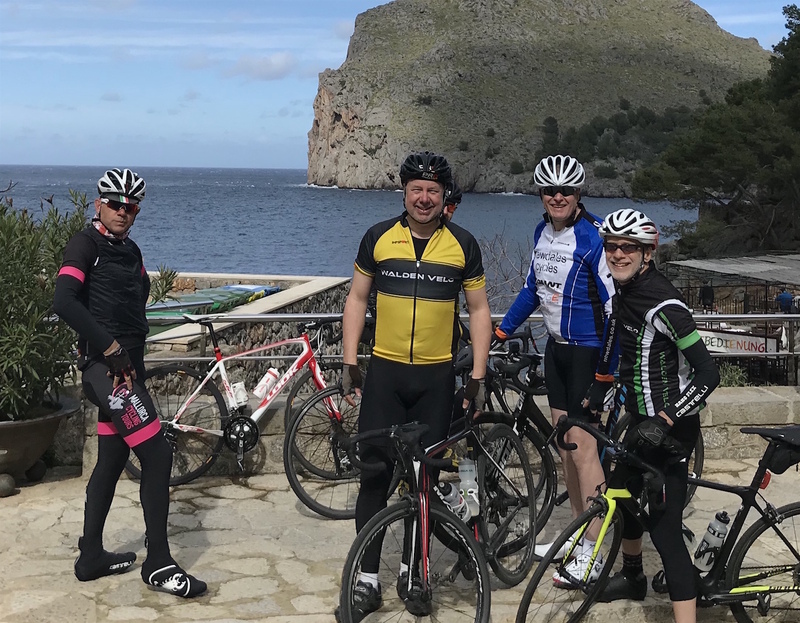 Meanwhile, Gary had been riding simulations of Sa Calobra on his turbo in the week before our trip, so he knew every curve and gradient of the real thing by heart. 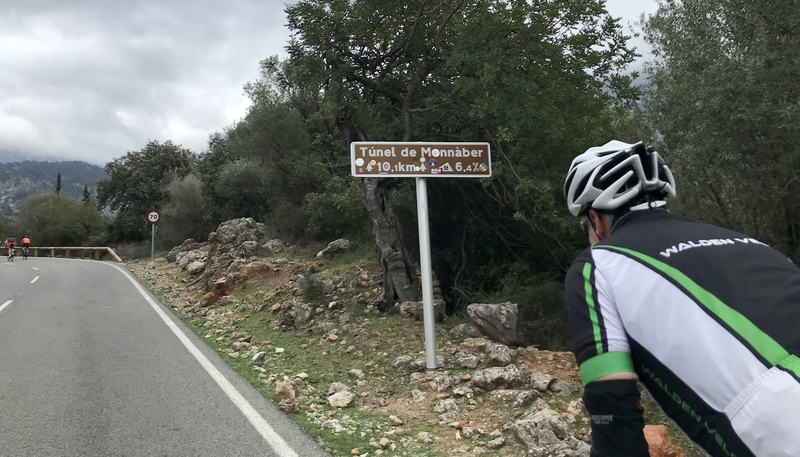 And David had unfinished business from his last trip to Mallorca, when he didn't make the descent, but succeeded in ticking that box this time. I shall return to do the same. For all of us, though, the legs and lungs definitely felt like they'd had a workout that day. 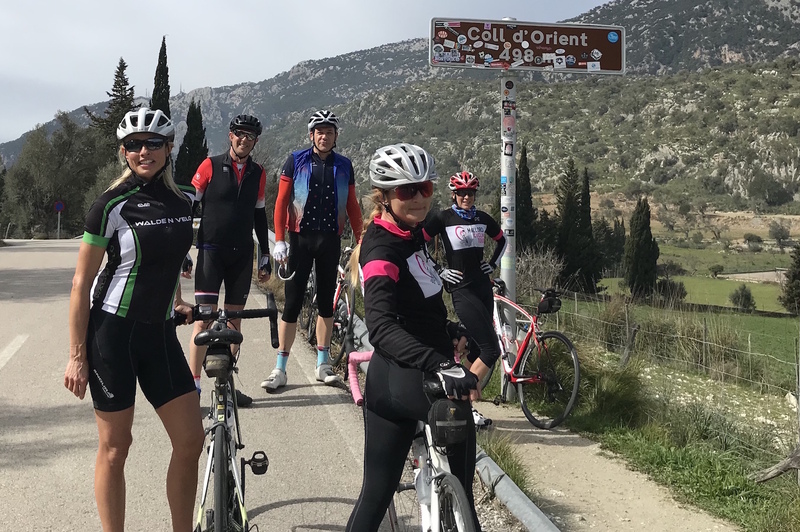 Our third day was pitched as a 'recovery' ride, but with Danni Kahn joining us again, it was never going to be completely relaxed. On top, she'd had a day's rest while we were slogging our way up Sa Calobra. Taking no chances, she wore her GB team top that day, safe in the knowledge that I wouldn't be able to 'twin' her on that one. But a malfunctioning zip on her GB gilet saw her graciously accept the offer of borrowing my gilet for a while, screwed up and sweaty though it was after being stuffed in my back pocket. 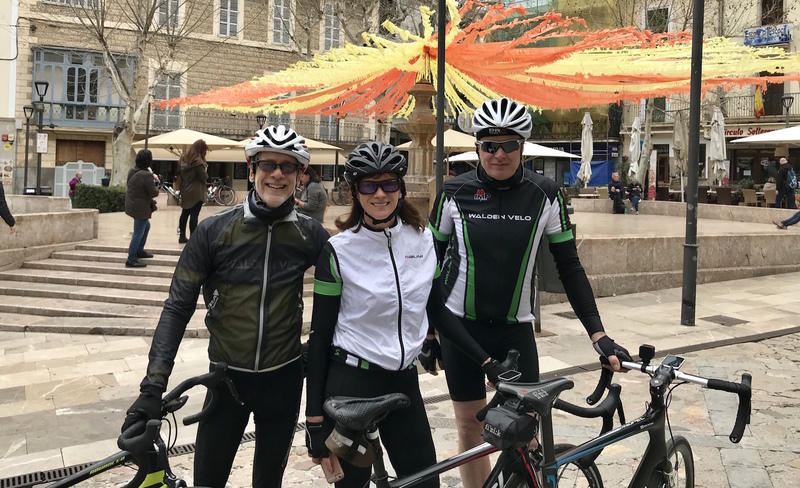 Our ride took us on a 62-mile, relatively flat spin over 1900 feet to Petra, which has a delightful square with a fountain in the middle. More almond cake. 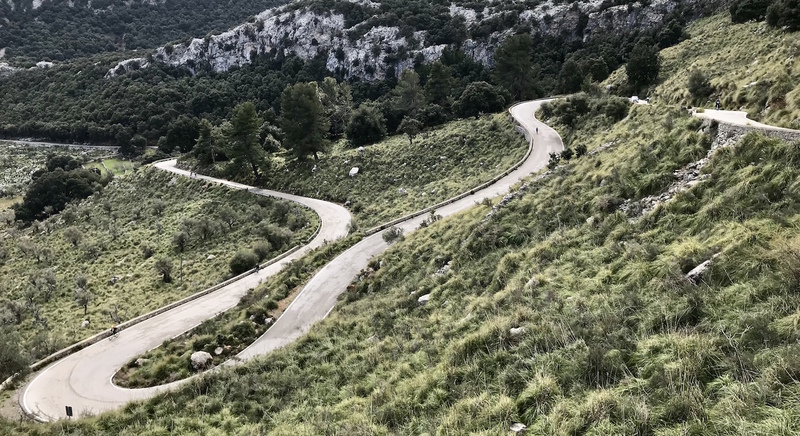 After a well-needed rest day, we took on the other major climb in Mallorca. At 4,741 feet, Puig Major is the highest point on the island, with a thigh-burning, 9-mile climb averaging 6% to reach it. 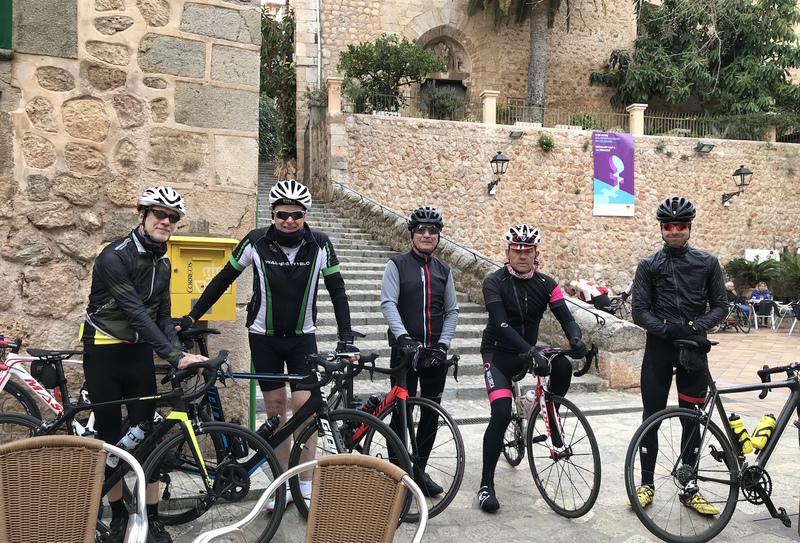 Once again, it was a challenging ride to even get to the ascent - taking in a 3-mile, 5% climb up Coll de Soller and a 40-mile ride on the flat before that. The weather was cooler that day, but a suitable accompaniment to the spinning grind required for going up big hills. David was the first of our group to reach the top, while I was fashionably late. 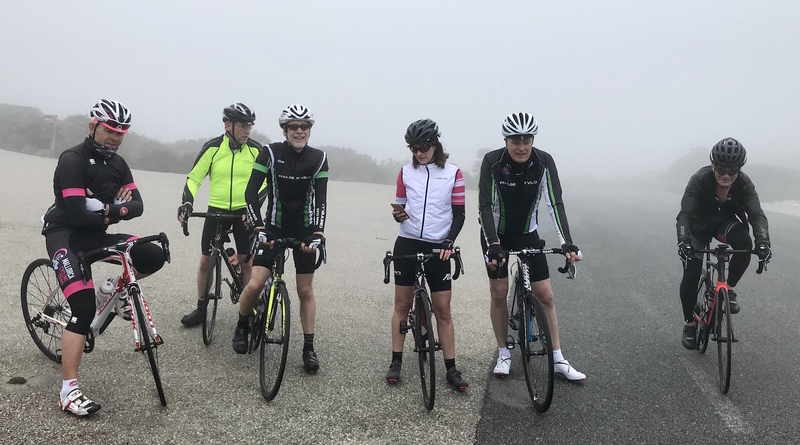 The chilly breeze at the top did not encourage any hanging about, so a WV team shot at the summit of Puig Major was not top priority for the advance party. 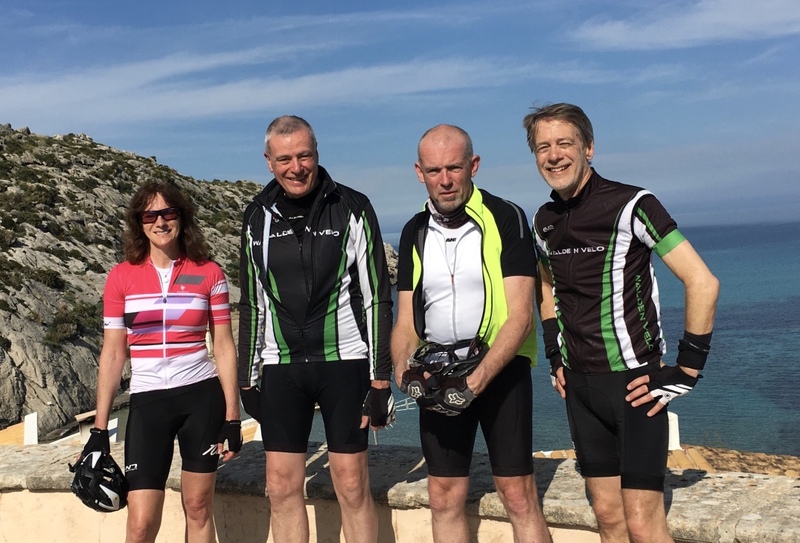 By the time we returned to Puerto Pollensa, we'd covered 85 miles with 6,000 feet of climbing. And we were ravenous. I think we sampled all the culinary delights that the Duva Aparthotel had to offer that night, including their throwback 70s dessert of green jelly, blancmange and chocolate sprinkles. Double helpings. Our last day was a relatively relaxed potter out to the lighthouse on the Cap de Formentor. Relaxed in terms of speed, but not without its hill challenges. 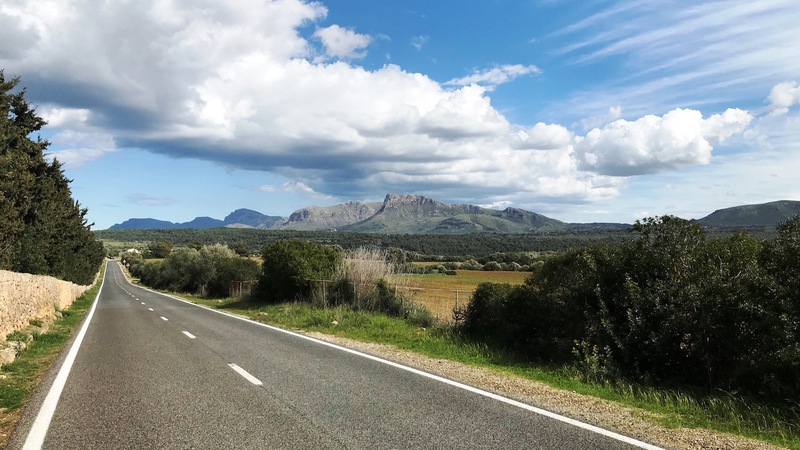 The ride out and back to Puerto Pollensa is only 27 miles, but you cover 3,500 feet of climbing along the way. And after conquering Puig Major the day before, our legs were less willing by this point. The mist took its time to burn off, so we didn't enjoy all the beautiful views that you would normally see. And the approach to the lighthouse itself was accompanied by some strong, gusty winds, which were disconcerting as we rode on the right-hand side of the road with its steep drop down. By the afternoon, however, the temperature had risen to a blissful 20 degrees. 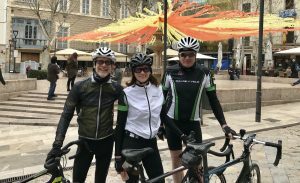 Alan, David, Gary and myself took a spin to the lovely inland town of Pollensa, where we had lunch in the square by the 365 steps - which reminded me of the Spanish steps in Rome, but these Spanish steps are actually in Spain. We pondered the wisdom of trying to do cyclo-cross training up and down them. On the way back to Puerto Pollensa, we diverted to Cala San Vincente, formerly a small fishing village. With the sun streaming down on us, we finally had chance to kick back and properly relax for the first time all week. Until Gary had a puncture on the way back. Winner of the club Strava crown! 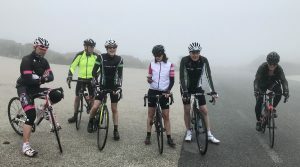 As the trip progressed, it became clear that we were in an unofficial competition as to who could take the club Strava crown that week for riding the most miles and climbing the most feet. 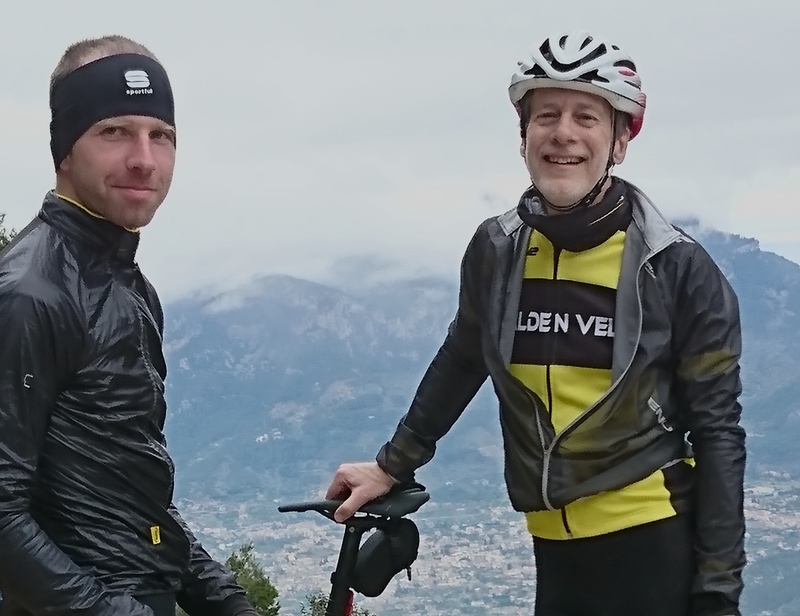 By the end of Wednesday, Lennart had thrown his hat in the ring with a covert 65-mile ride on our supposed rest day, putting him about 50 miles ahead of Gary and David. But after our lighthouse spin on Friday, technical problems prevented him uploading his ride from Garmin to Strava. As we all know, if it's not on Strava, it didn't happen. Such a shame. Nevertheless, to ensure a fair competition, both Gary and David dragged themselves out on the Sunday we returned to put in some more miles. 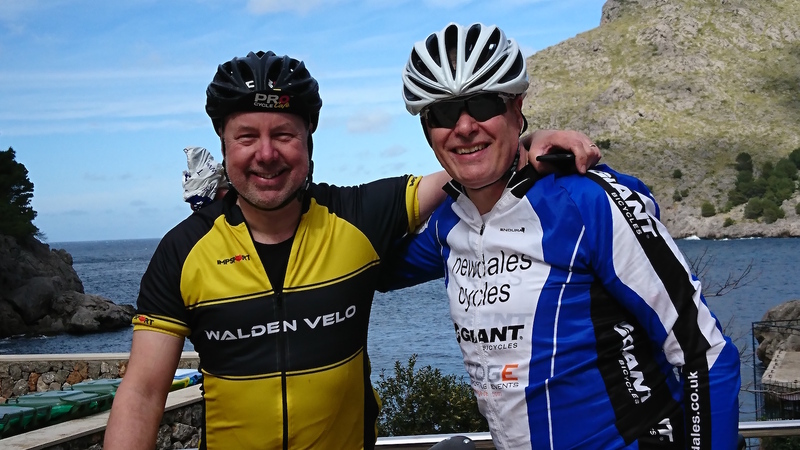 Gary succeeded in taking the week's crown, pedalling 300 miles over 20,000 feet, with David a close second on 275 miles and 19,350 feet. Kudos indeed, gentlemen. My only goal was to survive the week and be able to tell the tale.